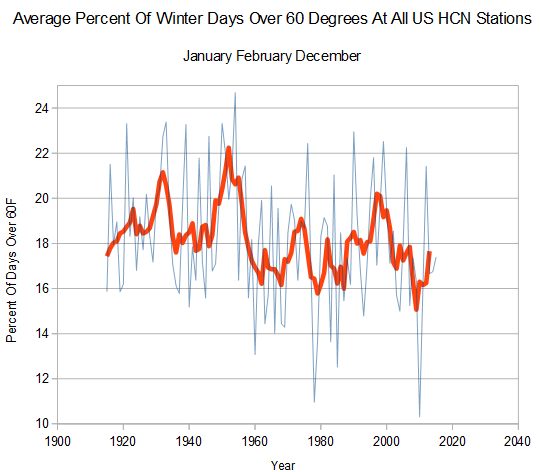 The frequency of warm winter days in the US has been declining for a century. 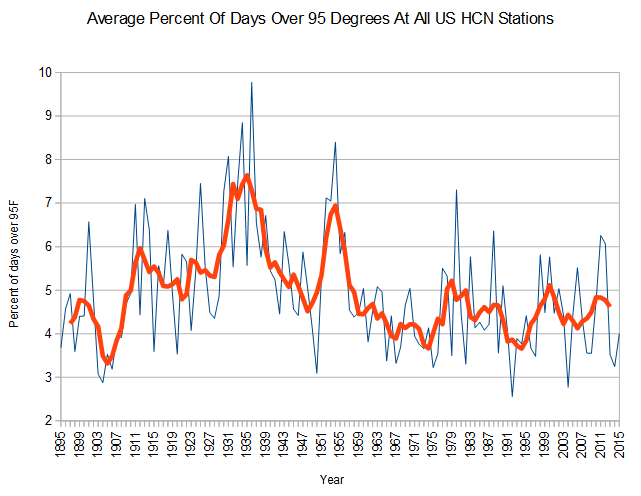 In 1954, almost one fourth of winter days in the US were over 60F, but in 2010 the percent of warm days just over 10%. Similarly, the frequency of hot summers days has declined. Warmth is becoming a thing of the past in the US. Panic in the Netherlands because december is warm. 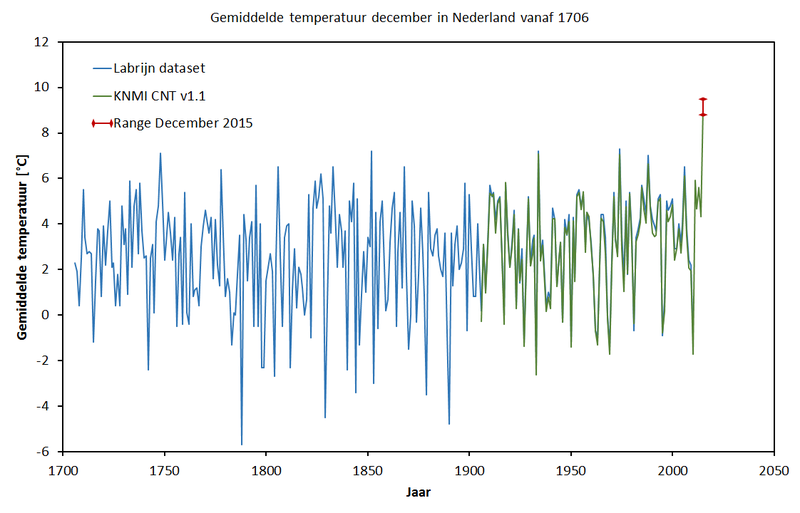 As if the modern warm december was more global than the medieval warm period. BTW where is the cold air today? US east coast and EU west coast are warm. Looking at a weather map, North Canada is pretty much freezing, and Greenland of course, as well as some Siberia. Antarctica might be described as jolly hot in -40 degrees. This is where the cold and snow is. The MSM, the elites Propaganda outlets are not about to tell you though. Higher peaks in the Sierra Nevada received up to 2 feet of snow, said National Weather Service meteorologist Dawn Johnson. Meteorologist Reed Timmer reports from the Oklahoma panhandle near Boise City with whiteout conditions and wind gusts near 40 mph. Turkey – 827 villages inaccessible due to snow. temperature will fall up to 3 degrees below zero. Record snowfall in Salt Lake City. Breaks 93-year-old record. Record-breaking day in Dodge City, Kansas. Almost eight inches (20 cm) of snow fell, breaking a 116-year-old record for Dec. 13 by 2.3 inches. STORM TOTALS OF 2 TO 2.5 FEET IN THE MOST PERSISTENT LAKE SNOWS ON THE TUG HILL PLATEAU … AND 12 TO 15 INCHES ACROSS LOWER ELEVATIONS. * WINDS…WEST 15 TO 25 MPH WITH GUSTS UP TO 35 MPH PRODUCING BLOWING AND DRIFTING SNOW. Fort Collins, Colorado, shatters snowfall record Almost double previous record. This brings the city’s snow total for the season to 20.1 inches, 3.6 inches above normal. A powerful storm dumped up to 24 inches (60 cm) across western states on Tuesday, prompting cancellation of about 500 flights at the Denver airport and leaving snowdrifts 3 to 4 feet deep. The storm left about a foot (30 cm) of snow in the Salt Lake City area and more than two feet in other places. Farther east, the Colorado plains received four to eight inches of snow. Yet another storm is forecast to bear down on the area today. Longyearbyen, Svalbard’s only town of any size, is currently enduring “the most violent storm at Svalbard in the past 30 years. Snoqualmie Pass, Cascade Mtns.WA BURIED in Snow. Snow depth increased 50 inches (127 cm) in 5 days – Two to three more feet (60-90 cm) due in the next 72 hours. The pass has been closed several times during the past few days, with chains often required. So far this year over 12 feet of snow has fallen in Snoqualmie, eclipsing the total snowfall of the entire last year. Four feet (120 cm) of snow for Wyoming with Locally higher amounts possible. MOUNTAIN SNOWS WILL CONTINUE THROUGH LATE THIS AFTERNOON…SIERRA MADRE RANGE-WINTER STORM WARNING UNTIL 5 PM THIS AFTERNOON…TOTAL SNOW ACCUMULATIONS…AN ADDITIONAL 3 TO 6 INCHES TODAY WILL BRING THE STORM TOTAL TO 3 TO 4 FEET. LOCALLY HIGHER AMOUNTS POSSIBLE ON SOUTHWEST FACING SLOPES. SOUTHWEST WINDS 25 TO 35 MPH WITH GUSTS AS HIGH AS 50 MPH POSSIBLE. NEAR WHITEOUT CONDITIONS POSSIBLE IN FALLING AND BLOWING SNOW. “Heavy snow and strong winds will create blizzard conditions from eastern New Mexico to the Texas Panhandle and southwestern Kansas, The storm will consolidate over northern Mexico Saturday and Saturday night. Areas of heavy snow will develop over New Mexico and the San Juan Mountains, then expand to parts of the central and southern Plains later Saturday into Monday. When it was dry in California, it was front page news. Now that they are getting needed moisture, there is not a peep about it. Tonight I was watching a show about Florida panthers and alligators, and they stated several times that the alligators are running out of room because of “climate change” causing sea levels to diminish alligator habitat. -The sea is rising by millimeters at most, and at the same rate it has been rising for over a hundred years, presumably before there was any “climate change”. – There are more gators than in a very long time, if not ever. Developers put in new retention ponds with almost every housing development, and they are adding more of them than ever during road construction projects. – The vast majority of gators live no where near the ocean, residing in the everglades and inland lakes, streams and swamps. The fabled loss of habitat due to climate change was stated baldy in matter of fact terms. If one had no other knowledge but the propaganda, the general impression would be that oceans are rising fast and drowning the coasts. The climate liars are completely out of control, just making crap up every day and in every possible situation. Facts mean nothing to these jackass lying scumbags. But Gail, that list can’t be true it’s….. the ‘Hottest Year Ever’ don’t you know everything is melting, we’ll be drowned in our beds by the boiling acid sea. We need Al Gorithm to fly around the world (again) to save us. There are massive cold pools over both the Atlantic and Pacific Oceans, where nobody lives. Those will be ignored or deleted out of existence by our alarmist friends. The one thing that is for sure is we have no idea what is actually happening, because the lies run so deep and wide. I suppose the satellite data is at least sort of believable. As we head towards the end or the year it is traditional to look at things and make an assessment of the situation. This is more important that any new-year’s resolutions or predictions. 1) We have lost the battle so far on the fact that a warmer world is a very good thing. If only CO2 did increase temperatures! Looking at warm periods in the past we see that life on this planet flourishes in the warmth. The planet is way too cold now. 2) We have failed to get out the word (though Steve Goddard tries!) that the honest temperature record in this interglacial is one of ups and downs with the cold periods being colder each time. The warm periods are not as warm each time either. And we have allowed the liars in government and the grant-seekers to cook the books without the public being made award of the horrible scientific fraud. They say there was no Little Ice Age! Son of a B! 3) We skeptics have even failed to make our lukewarmer friends see that CO2 can not and does not warm the surface. There is an “atmospheric effect” due to gravitation, solar insolation, orbital changes, water in all its phases (such as the oceans and humidity), conduction, convection, advection, and other factors. There are many factors, but CO2 doubling just is not one of them. The net effect of CO2 is cooling. Look to the upper atmosphere and see how CO2 radiates heat out to space for example. We can fight on ignoring number 3 (one may not mention number 3 at WUWT very much or you will be shown the door), but we are failing at number 1 and number 2 also. I don’t have any answers other than keep trying to put some facts out there and hope for the best. I hope the new year brings our side success, but I am not as optimistic as many of my friends seem to be. My main source of optimism is the belief that a big fat lie must eventually be shown for what it is. One cannot misrepresent reality forever. But this is, I confess, mostly wishful thinking. it is more than wishful thinking that reality will prevail over propaganda. The problem is how long it may take and the price we will all pay. But I believe that’s what you are thinking, too. Yes, and thank you for the clarification. It would be more accurate for me to say I am tired of waiting for some sign that the tide is shifting. “Eventually” covers a lot of time. If you look at the goals and look at what the Elite has accomplish you will see they have just about everything they want. Therefore expect a shift to another ‘scare’ fairly soon. #1. A tax to support the UN – That was what was agreed to with the USA eventually forking over 1 trillion a year. The Trans-Pacific Partnership trade agreement has the enforcement part of the Climate arement. link 1 and summary. #2. A shift from coal, oil and nuclear to natural gas. Wind and solar were never meant to be anything but a short term scam. Ged Davis was VP of Shell Oil when he was IPCC lead author for scenarios. Of particular interest is his optimum scenario, Sustainable Development (B1) aka Agenda 21. No Nuclear, Coal and Oil phased out leaving Natural gas as the winner with ‘Green Energy’ also owned by BP, Shell and their internationalist buddies, as the big winners. 1. Widespread expansion of natural gas, with a growing role for renewable energy (scenario B1N). Oil and coal are of lesser importance, especially post-2050. This transition is faster in the developed than in the developing countries. This exactly what we are seeing as my comments starting HERE show. 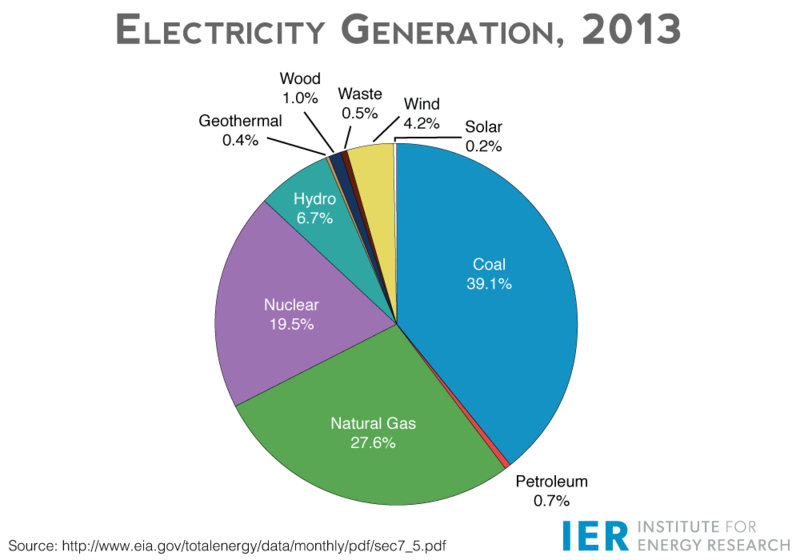 Closing of oil and coal plants, nuclear out of the mix and natural gas the big winner. A nod to renewable but no real dependence. The destruction of out property right has also been accomplished. The passage of the Food Safety Modernization Act allows the World Trade Organization to regulate US farmers. Those regulations allow any farmer to be bankrupted and forced off his land. …US president George H.W. Bush signed the document for the US. In signing, each nation pledge to adopt the goals of Agenda 21. In 1993, President Bill Clinton, in compliance with Agenda 21, signed Executive Order #12852 to create the President’s Council on Sustainable Development in order to “harmonize” US environmental policy with UN directives as outlined in Agenda 21. The EO directed all agencies of the Federal Government to work with state and local community governments in a joint effort “reinvent” government using the guidelines outlined in Agenda 21. As a result, with the assistance of groups like ICLEI, Sustainable Development is now emerging as government policy in every town, county and state in the nation…. Land-use controls found their way into the 1987 report of the World Commission on Environment and Development, “Our Common Future,” which first defined the term “sustainable development.” The meaning of sustainable development here defined was codified in another U.N. document called “Agenda 21,” which was signed by President George H.W. Bush in 1992. This document recommended that every nation create a national sustainable development initiative…. So it looks like they have everything in place.